The earliest potential records of henna use come from Egypt. Mummified bodies have been found with what appears to be henna-dyed hair and hennaed fingers; the mummy of Ramses II, among others, was noted to have hennaed fingertips and toes. The earliest of these findings dates back to the predynastic period of Egypt, approximately 3400 BCE. Infra-red analysis has confirmed that the orange-red colouring is consistent with the active molecular ingredient in henna, hydroxy-naphthoquinone; the results of the microscopy also suggest, interestingly, that the henna was applied after death. If so, this may perhaps indicate the use of henna in some kind of mourning ritual or ceremony for the dead. While the mummy of Ramses II has henna-dyed hair, microscopic analysis confirms that he was in fact red headed in his youth; it could be suggested, therefore, that the henna was applied to restore his youthful appearance, either in his old age or during the mummification process. If archaeological evidence suggests that henna was used in ancient Egypt, we should expect confirmation from textual evidence; however, possible references to henna in Egyptian texts are extremely unclear. Some people claim that a variety of medicinal uses for henna are described in the Ebers Papyrus, but unfortunately this is based on a misreading of the word 'cyperus' (in a translation of the text) as referring to henna (later referred to as kupros in Greek and cyprus in Latin), when it in fact refers to Cyperus rotundus, a type of papyrus. Scholars have identified a variety of Egyptian plant-names as possibly referring to the henna plant. The most promising candidate is the plant known in ancient Egyptian as the ‘nḥ-imi-plant, which might be tentatively translated as the ‘Life-is-in-it’-plant. It was used both medicinally, as a treatment for tumours, as well as ritually: the hands and feet of the deceased were anointed with it during the embalming process, and it was described as protecting the bed of the Pharaoh. The name ‘Life-is-in-it’ clearly expresses some ritual or magical significance; some suggest that its scent was thought to bring the dead back to life. While it would be tempting to connect this to archaeological records of hennaed mummified bodies and posit the existence of a postmortem henna ritual in ancient Egypt, we must be very cautious. There is no indication in any Egyptian text that the ‘nḥ-imi plant had any colouring properties, and the identification of ‘nḥ-imi with henna is tentative at best. Other scholars have presented evidence that the ‘nḥ-imi plant is not henna, and identify ‘nḥ-imi as a type of lotus, perhaps the white lotus, Nymphaea lotus. Furthermore, I am not aware of any depiction in Egyptian art of people with henna, either in hair or on skin. Given the archaeological and textual evidence, it is possible to say that henna may have been known in ancient Egypt for a variety of functions, but its exact use and ritual significance cannot be definitively ascertained. A clay tablet with a Ugaritic inscription. It appears that henna was also known and used in ancient Ugarit [modern-day Ras Shamra, Syria: a city-state on the Mediterranean coast that flourished between 1500 and 1200 BCE] for a variety of purposes. A short tablet in Ugaritic cuneiform dated to the late 13th century BCE, numbered KTU 4.767, references the word kprt. The text is fragmentary and its meaning is not altogether clear; modern scholars have suggested that it refers to henna, based on references in other Ugaritic texts to henna (kpr). Duane Smith proposes that this is a medical prescription; his translation reads “When in pain a wrapping of henna cures, [while] sickness consumes”. A ritual use of henna in preparation for battle appears to be recorded in the Ba‘al Cycle, a collection of Ugaritic tablets recording one version of a myth concerning Ba‘al and ‘Anath. These tablets date from 1400-1350 BCE. The story describes the struggle between Mot, the god of death, and Ba‘al, the storm god and god of life and fertility, helped by his sister ‘Anath, warrior-goddess of fertility. The portion of the text in question is unfortunately extremely fragmentary; it appears to describe the goddess ‘Anath being adorned, before she leaves to fight the followers of Mot, with perfumes, purple from a seashell, and kpr, henna dye (fragment KTU 1.3:II.2). This is in accordance with a motif of ritual washing in Ugaritic literature, where characters prepare themselves for meals, sacrifices, or battles by washing themselves and adorning themselves with purple or red dye. It is unclear whether ‘Anath is preparing herself for the victory feast or for the battle. The description of ‘Anath adorning herself is repeated in two other fragments which appear to be copies of the previous section (KTU 1.7.15, 1.7.35). The interpretation of kpr as henna in this text, however, is disputed by several scholars: some see the line as too fragmentary to translate, and others note that the reading of kpr as henna is unlikely: if ‘Anath has already used the purple murex dye, the additional use of henna would appear extraneous. This myth is seen by de Moor as a seasonal metaphor, with the death of Mot and the return of Ba‘al corresponding to the grain harvest and the beginning of the winter rains. In this interpretation, ‘Anath’s use of henna might testify to a ritual use of henna in an annual celebration at the end of autumn before the grain harvest. However, once again, we must be very cautious in reconstructing henna use from ancient textual references without any direct corroborating evidence; furthermore, as we have seen, de Moor’s seasonal interpretation is challenged by many scholars, as is the reading of kpr in this text as henna. It can be tentatively concluded, though, that henna was probably known to the ancient population of Ugarit for medicinal purposes, and may have also been used ritually as part of victory celebrations. The Semitic root kpr, either in the Hebrew kopher or another form, was borrowed into Greek as kupros, and from there it apparently spread into late Egyptian Demotic and Coptic as qwpr or kwpr; this appears in Hellenistic Egyptian papyri as a medicine and as a sweet-smelling plant, interestingly, in a funerary context: the Papyrus Harkness records that the deceased woman is buried with a grapevine to provide drink in the afterlife, a henna bush [b‘.t kwpr] to provide perfume, and an ebony shoot to provide shade. The earliest record of kupros in Greek appears to be in the botanical work Peri phutōn historias [Concerning the Investigation of Plants] by the Greek scientist and philosopher Theophrastus (c. 371 – c. 287 BCE). He writes, in the section on perfumes and scents, Peri Osmōn [‘Treatise on Smells’]: “For each perfume [muron] they add the appropriate aromatic [spices], such as in the [manufacture of] kupros [perfume], mixing in cardamom and aspalathos, [soaked] in fragrant [wine]… The manufacture of kupros [perfume] is similar to that of [making] rose [perfume]” (Peri Osmōn 25-26). The henna plant (kupros) is mentioned by several Greek and Roman writers as growing in the area of the Levant. In the Stephanos [Garland] of Meleager (1st century BCE), Meleager describes the epigrams of Antipater of Sidon [modern-day Ṣayda, in southern Lebanon] as phoinissan te neēn kupron [fresh reddening henna]; this implies that henna was grown, or at least associated, with Sidon and the Levantine coast (phoinos means deep-red or purple, and the verb phoinisso means to redden or empurple (this is the origin of the word Phoenician, due to the Phoenicians’ involvement in the dyeing industry and the manufacturing of Tyrian purple). Meleager here is making a pun on the fact that Antipater of Sidon is Phoenician). Two centuries later, the Greek doctor and botanist Dioscorides (ca. 40-90 CE) wrote that the best henna (kupros) grows in Ashkelon, in the Land of Israel, and Canopus, in Egypt; he noted that the leaves applied as plaster are effective in treating inflammations and blisters and that the crushed leaves dye the hair orange (Peri hules iatrikes, I.124). Terracotta votive statue depicting a woman with hennaed hair, Hellenistic Italy, 4th-3rd century BCE. The Roman historian and naturalist Pliny the Elder similarly writes in his Naturalis Historia (circa 77-79 CE) that the best henna (cyprus) is grown in Canopus, Ashkelon, and Cyprus (Naturalis Historia XII.51), and some make cyprinum (the perfume made from henna blossoms) by adding myrrh and panax as well; the best of this, he claims, comes from Sidon, and the next best from Egypt (NH XIII.2). Pliny then speaks of ointments (unguentum) which include perfumed oils as well as solid plant matter, and so it is interesting that he notes that ointment with henna has a green colour (NH XIII.2); does this perhaps suggest that henna leaves were used in this ointment as well? Later on, Pliny writes that henna leaves were used both medicinally and for dyeing: “We have already spoken of the nature of cypros and how [perfumed] oil is made from it... The fresh leaves are kneaded and used as a cure for sores on the head and in the mouth. A compress of the leaves is good for burns and sprains. The leaves, mixed with strutheum [likely an error for struthion, soapwort, which is mentioned in the parallel passage in Dioscorides, I.124], will colour the hair red” (NH XXIII.46). Henna (kopher) is mentioned in the Mishna [a Jewish compilation of oral rabbinic legal traditions, codified in the Land of Israel around 200 CE] as an agricultural product of the Land of Israel that is subject to the laws of tithing (Shevi’it 7:6), since it falls in the category of products that are either fit for consumption, or used for dyeing (Shevi’it 7:1). Since henna is not fit for consumption, it can be assumed that henna was grown in the Land of Israel in the Mishnaic period for its use as a dye; whether it was used to dye skin, hair, or fabric, is unclear. Henna is mentioned in the Talmud [another Jewish legal compilation, building on the Mishna, codified in Babylonia circa 500 CE], as a medicinal ointment. Aufrère, Sydney. 1987 Études de lexicologie et d’histoire naturelle XVIII–XXVI. Bulletin de l’Institut Français d’Archéologie Orientale, Vol. 87. Balout, Lionel. 1985 La Momie de Ramses II. Bonomi, Joseph, and John Lee. 1858 Catalogue of the Egyptian antiquities in the museum of [J. Lee at] Hartwell house. Cassuto, Umberto. 1971 The Goddess Anath: Caananite epics on the Patriarchal Age. Charpentier, Gérard. 1981. Recueil de matériaux épigraphiques relatifs à la botanique de l’Égypte antique [Review of epigraphic material relating to the botany of ancient Egypt]. Clack, Jerry. 2001 Dioscorides and Antipater of Sidon: the poems. Corvo, Frederick [Frederick William Rolfe]. 1937 The Songs of Meleager. Cross, Frank Moore. 1968 The Canaanite Cuneiform Tablet from Taanach. Bulletin of the American Schools of Oriental Research, No. 190. David, Rosalie. 2008 Egyptian Mummies and Modern Science. de Moor, Johannes. 1971 The seasonal pattern in the Ugaritic myth of Baʻlu, according to the version of Ilimilku. Dietrich, Manfried and Oswald Lorenz. 1988 Die Keilalphabete: Die phönizish-kanaanäischen und altarabishen Alpabete in Ugarit; Abhandlungen zur Alt-Syrien Palästinas [Cuneiform: the Phoenician-Canaanite and ancient Arabic alphabets in Ugarit; essays on ancient Syria-Palestine], Vol. 1. Dijkstra, Meindert. 1986 Another Text in the Shorter Cuneiform Alphabet (KTU 5.22). Ugarit Forschungen 18. Ebers, Georg. 1889 Papyrus Ebers: Die Masse und das Kapitel Über die Augenkrankheiten [The Ebers Papyrus: The degree and section on eye diseases]. Fletcher, Joann. 2002 Ancient Egyptian Hair and Wigs. The Ostracon: The Journal of the Egyptian Study Society, Vol. 13, No. 2. Germer, Renate. 2008 Handbuch der altägyptischen Heilpflanzen [Handbook of Ancient Egyptian Medicinal Plants]. Griffith, Francis Llewellyn and Herbert Thompson. 1904 The Demotic Magical Papyrus of London and Leiden. Hillers, Delbert. 1964 An Alphabetic Cuneiform Tablet from Taanach. Bulletin of the American Schools of Oriental Research, No. 173. Hooke, Samuel. 1963 Middle Eastern Mythology. Hort, Arthur. 1916 Theophrastus: enquiry into plants and minor works on odours and weather signs. Jackowski, Christian, Stephan Bolliger, and Michael Thali. 2008 Scenes from the Past: Common and unexpected findings from mummies from ancient Egypt and South America as revealed by CT. Radiographics: the journal of continuing medical education in radiology, Vol. 28. Joachim, Heinrich. 1890 Papyros Ebers: Das älteste Buch über Heilkunde [The Papyrus Ebers: The Oldest Book on Medicine]. Johnson, Janet (ed.). 2004 “Qwpr”. Chicago Demotic Dictionary (CDD): Q. Available online at http://oi.uchicago.edu/ research/pubs/catalog/cdd/. Manniche, Lise. 1989 An Ancient Egyptian Herbal. Maspero, Gaston. 1886 Procès-verbal de l'ouverture des momies de Ramsès II et Ramsès III. Comptes-rendus des séances de l'Académie des Inscriptions et Belles-Lettres, 30e année, N. 2. Nunn, John Francis. 1996 Ancient Egyptian Medicine. Renaut, Luc. 2009 Recherches sur le henné antique. Journal of Near Eastern Studies, Vol. 68, No. 3. Ritner, Robert. 2000 Innovations and Adaptations in Ancient Egyptian Medicine. Journal of Near Eastern Studies, Vol. 59, No. 2. Smith, Duane. 2006 Medical Text from Tell Taanach: KTU 4.767. Retrieved from: www.telecomtally.com/blog/ugarit/ktu4.767.pdf. Smith, Mark S. 1994 The Ugaritic Baal Cycle. Smith, Mark J. 2009 Traversing eternity: texts for the afterlife from Ptolemaic and Roman Egypt. Wright, David. 2001 Ritual in Narrative: the dynamics of feasting, mourning, and retaliation rites in the Ugaritic tale of Aqhat. Wyatt, Nick. 2002 Religious texts from Ugarit. Young, Gordon Douglas. 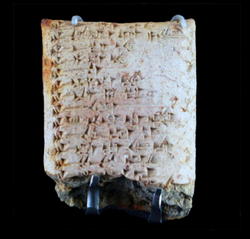 1981 Ugarit in Retrospect: fifty years of Ugarit and Ugaritic.